Home Trades The “sell in May” phenomenon is in full effect. In my webinar earlier this month, “How to Collect 15% from Stock Market Insurance“ I presented the following slide and discussed the importance of protecting yourself against market declines. More importantly, I gave a few real-world examples of how we, as self-directed investors, can best implement such a strategy into our own portfolios. We all know declines are inevitable, so it amazes me why self-directed investors choose to ignore strategies that allow a stock to go slightly higher, stay flat or catastrophically lower and make gains. The strategy: credit spreads, more specifically, selling vertical call spreads. I talk about the importance of using credit spreads in your stock market portfolios. If you are not, you are not using one of the most effective strategies in the marketplace. portfolio. Both trades led to gains of 21% and 13% over the course of the last month while the market was moving steadily lower. And both would have been profitable even if the underlying Nasdaq 100 ETF (NYSE: QQQ) pushed as high as $69. The Options Advantage portfolio has experienced similar results over the past several months using credit spreads on the S&P 500 (NYSE: SPY). Is your portfolio prepared for stock market declines? If not, don’t panic. It’s never too late to learn. Whether you choose short, intermediate, or long-term strategies (hopefully a combination of all three) always remember, investing is ultimately a long-term endeavor to create wealth…which is exactly why I am constantly trying to teach people how to effectively use credit spreads for both income and as a hedging strategy. Again, we all know the market doesn’t advance in a straight line. Bull runs come in spurts. And the spurts are typified by a steady advance. Bear runs come in spurts as well. However, unlike bull runs, bear runs typically come hard and fast. 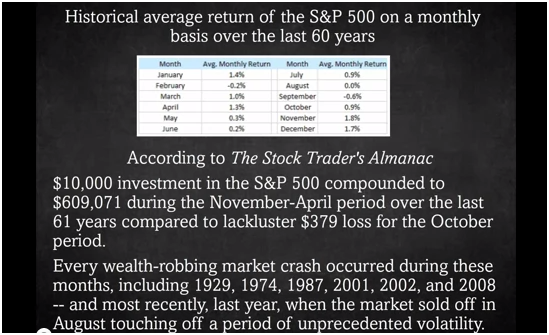 But the most notable of often forgotten stat regarding market action…. 75% of the time it moves sideways. And what are we doing during these stagnant times? We are all losing out on opportunity costs. This is when leverage makes the most sense. Not being greedy and trying to hit the homerun, but to use a small amount of money to implement sound strategies that effectively combat slightly higher, sideways or declining markets. It was late April and the old Wall Street adage “sell in May” period was nearing. The market had pushed steadily higher for roughly 3 &frac12; months before losing stream in April. The market was overbought and the market felt top heavy. So it was the perfect time to teach people how to use credit spreads to enhance their overall portfolio returns. Expecting a sideways, lower or even a slightly bullish market ahead I wanted to look back to what sectors led the recent charge higher. 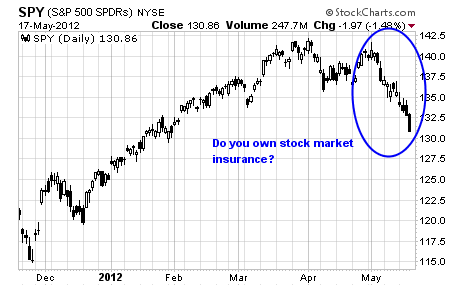 Of course, with Apple’s rapid advance and 18% share the Nasdaq 100 ETF (NYSE: QQQ) was the obvious choice. At the time of the trade QQQ was trading for slightly more than $66 and was overbought state over the intermediate-term. Typically, this means that the probability of a months- long pullback was high. By selling theQQQ call spread I was basically making the assumption that QQQ could move $3 or 4.5% higher, move sideways or lower and I would make 18.3% on the trade. The trade had a probability of success of over 80%. And remember, a basic stock trade has a probability of success of 50%, it’s either going to go up or down. If we takeanother look at the QQQ chart above we can easily see what has happened since the May began…..QQQ has tumbled. As a result, the QQQ trade I mentioned in the webinar made over 18% thereby effectively hedging some losses of the typical stock-only portfolio. Moreover, the last several SPY trades for the Options Advantage portfolio have made roughly 15%. With the summer doldrums nearing I expect to see much of the same. In fact, the summer months (as proven by the “sell in May” phenomenon) are seasonally the best time to enact income producing strategies while hedging downside risk.